We will continue to provide updates as information reaches us. We anticipate additional office closings over the next couple of days as the “superstorm” rages through the Northeast and we will continue to update you here as we receive information. Our thoughts and prayers will be with our NACA colleagues and members the next few days as they ride out this historic weather event! As every NACA member knows, e-mail is by far the most commonly used means for NACA and its members to communicate with each other. It is the primary means for communicating with NACA staff members in both the Home Save and Purchase Programs, plus our way of sending special notices and alerts to all our members. However, if your email address is supplied by Comcast, you may be missing vital information regarding your efforts to purchase a home or save your present home. Comcast’s e-mail system is set up in such a manner that the large volume of mail coming from NACA to Comcast subscribers, especially on the West Coast, automatically (and falsely) triggers a spam alert in their system, which in turn causes their system to block all messages coming from naca.com. Every few weeks, we discover that members are not receiving information we send them and only then do we learn that Comcast has once again blocked NACA e-mails. Our IT department contacts Comcast each time this occurs with a request to un-block our communication, but a few weeks later it happens all over again. Comcast has not advised us of any way in which they can resolve this problem, even though they are the only e-mail provider in the country with which we experience this problem. We have no problems whatsoever with AOL, RoadRunner, AT&T, G-mail, Yahoo, MSN or any other provider, only Comcast. Therefore, if your e-mail has a Comcast address, please call our Member Services department at 888-404-6222, option 4 and provide the representative with an alternative e-mail address so we can insure that important information reaches you in a timely fashion. Please note that for security purposes, we cannot accept e-mail changes by any other method. We must verify your identity before we make changes to any part of your basic contact information. If you do not presently have an alternative e-mail address, free e-mail accounts are available through several providers such as Yahoo, MSN and G-mail. We apologize for the inconvenience, but after several months of seeking a solution through Comcast, none has been forthcoming and we ask that Comcast subscribers please help insure that we are able to maintain an open line of communication with each of our members. Did you know that NACA has is very own weekly radio program? Join us each Wednesday at 1:00 p.m. Eastern Time/10:00 a.m. Pacific Time for “NACA Radio” on www.LATalkRadio.com channel two. Each week, the program looks at the latest news and developments in our nation’s continuing mortgage crisis, discusses NACA’s ongoing advocacy efforts for the American homeowner, recent American Dream Tour events and upcoming tour schedule, and features weekly live commentary from NACA Founder and CEO Bruce Marks. Debuting in March of 2011, NACA Radio is co-hosted by Ethan Dettenmaier, who is host of LA Talk Radio’s “Combat Radio” program as well as a NACA member, and Tim Trumble, a highly experienced NACA Counselor, thirty-year radio veteran and present member of NACA’s Online Operations team. They are frequently joined by NACA Director of Communications and Public Affairs Darren Duarte. A two time Emmy Award winning journalist, Darren’s experience as a Congressional aide and later a reporter in Washington DC gives him a unique insight into the political side of the mortgage crisis. Bruce Marks’ weekly live commentary is always informative and is often the first announcement of NACA’s latest advocacy efforts and advances in both the Home Save and Purchase Programs. You never know where Mr. Marks’ reports will be coming from, although it’s almost never from his Boston office. Whether checking in from an American Dream Event, calling from Washington between meetings with Congressional leaders or just before a protest in front of the home of a predatory lender’s CEO, you will get a weekly update direct from the man who started it all 24 years ago. Ethan and Tim also have frequent guests, including NACA members who have received modifications at American Dream Events, staff members from NACA’s various departments, and have even been known to have a celebrity show up in the studio on occasion to support NACA’s efforts! NACA Radio is informative, intense and insightful, and it’s never the same two weeks in a row. For those who are unable to tune in live, the program can also be downloaded as a podcast from www.LATalkRadio.com and from iTunes. Join us this week and every Wednesday for NACA Radio and stay on top of NACA’s latest efforts on behalf of the American Homeowner. As many of you are aware, we created a new version of the NACA Forum roughly two months ago after experiencing significant problems with the old version during a system upgrade. Since that time, a phenomenon has occurred that I have to ask our Forum members and visitors to please stop doing. The previous version of the Forum included the ability to send personal messages and e-mails to other members, a feature which the new version does not have. As a result, I have included my e-mail address in my Forum signature so members will be able to reach me directly when I have advised them to do so. However, several people, especially new visitors to the Forum, have bypassed the Forum completely and e-mailed me directly instead of posting their questions or concerns here on the Forum. Please understand that this practice defeats one of the key purposes of the Forum, to help NACA members share their experiences and learn from each other. As unusual as your concerns may seem, it is very probable that other NACA members are experiencing something very similar to you. Many of your questions are in fact far more generic than you may think. By sharing the information through the Forum, we are able to help educate everyone who comes to the Forum either as a member or visitor, making it possible to maximize the effectiveness of the advice and direction we give our members. While most of the e-mails I have received have started out with very kind comments like, “I saw your e-mail address in the forum, and you seem so helpful…”, YOU can be of great help by not bypassing this Forum and allowing us to help as many members as possible through this medium. Please remember to NEVER post any personal information in the Forum, including your NACA ID number. Should your question require a review of your file for specific information, you will be asked to e-mail your name and ID number at that point in time. We also keep a database of our Forum members, so once we have that information, we will have it available for future reference if needed. Once a direct e-mail correspondence has started, we will continue to communicate that way to protect your personal information and details of your file. I’m sure everyone is aware just how massive the demand is for NACA’s services in both our Purchase and Home Save programs. By making use of this Forum to share questions and experiences we can help the most people possible whether they are attempting to save their home or become new homeowners. 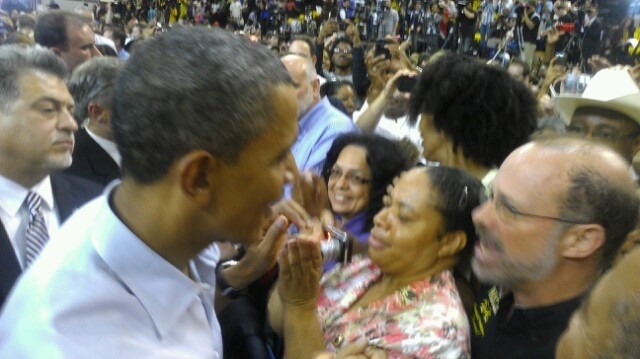 NACA Founder and CEO Bruce Marks while taking a break from the Richmond Event talks to President Obama at his campaign kick off rally in Richmond,VA regarding the issues that struggling homeowners with government backed loans are facing and how his administration needs to work harder on fixing FHA. If you have not obtained an affordable solution with your FHA mortgage, this message is very important. While NACA has been extremely successful modifying mortgages, FHA mortgages have been the most difficult. Thus we need to take action and ask President Obama why he is failing homeowners who have a government-backed FHA mortgage. While the best solution for a FHA borrower is the FHA-HAMP solution, FHA makes it extremely difficult to obtain this solution. This solution reduces the outstanding principal by up to 30%, reduces the interest rate to the current market rate which is about 4% (the reduced principal must be repaid at the end of the loan term), and extends the loan term to 30 years. While this solution is not as good as ones provided by other lenders, where interest rates are reduced to as low as 2% and a portion of the outstanding principal eliminated, FHA-HAMP is the best option available at this time. a. Provide the NSC with your FHA case number. Get your case number from your lender, FHA case number can be found in the top left corner of your HUD 1 settlement statement received at closing or NACA (contact NACA at FHA@naca.com). b. Insist on filing a complaint. Do not take no for an answer. d. Tell the NSC you are working with NACA. 2. If you are not satisfied with the NSC response, please take the following action. a. Contact FHA Commissioner Carol Galante. Commissioner Galante needs to understand what you are going through. You can contact her by emailing her at Carol.J.Galante@HUD.com or by call her office at 202-708-2495.
b. Number of months late or if you are current. c. Your experience with your lender as well as FHA. d. Are you willing to participate in actions and activities against FHA. These include demonstrations, meeting with Members of Congress, holding President Obama accountable (i.e. at his campaign appearances), and other actions? NACA will continue to be your advocate. While FHA has not been responsive to our efforts to work with them, we will not take no as an answer and neither should you. We are working with tens of thousands FHA borrowers as well as hundreds of thousands of other homeowners who we can involve in activities to make FHA work for its borrowers. It is outrageous that FHA, as the Obama Administration’s major government housing program, is one of the worst in helping homeowners save their homes. We need to tell President Obama to standup for homeowners and to set the standard with FHA borrowers. NACA’s Advocacy Campaigns – What We do & Why We Do It? We have enclosed a video of NACA’s founder and CEO getting arrested advocating for Chase homeowners at the Senate Banking Committee. Click here to view this story which is sweeping through the internet. Also to view the prior video of Dave Lowman, Chase’s CEO for Home Retention, telling homeowner’s having difficulties to “Come to Me”. Click here for the video showing him lying to Congress and homeowners. NACA will continue to fight for all homeowners. As in all of our previous actions we have important friends, including the police who let us off without being charged. They also provide us access to the gated communities where these CEOs live in the lap of luxury. These police and security guards are like millions of homeowners who are either at risk of foreclosure or know someone very close to them who is in danger of losing their home. Everyone is frustrated and angry at the lenders. We will continue the fight and continue to confront Chase and others, wherever they go and where they live, who get in the way of homeowners achieving a long-term affordable mortgage payment. We are working with the lenders to have a proposal or follow-up for every homeowner prior to the end of the year. Please continue to access your Web-file for updates by clicking here. We are determined to get this done for everyone who is committed to staying in their homes. We want to express our sincere thanks to the hundreds of homeowners who, with very little advance notice attended the Senate hearing. Your presence sent a very strong message. NACA is the most effective organization advocating for hundreds of thousands of homeowners. NACA is able to save hundreds and sometimes over a thousand dollars a month through NACA’s legally binding agreements with all the major lenders and investors. We will keep up the fight and look forward to your active participation. P.S. NACA is engaged in a campaign against Chase called “Chasing Chase”. Click here for details on the campaign.